When a new graduate dormitory opens in the fall of 2008, it will house the relocated residents of the oldest graduate dormitory on campus, Ashdown House. Boston Police broke up an evening party last Thursday, Feb. 9, at the Delta Upsilon fraternity in Boston. David N. Rogers, assistant dean and director of fraternities, sororities, and independent living groups said that the house was shut down temporarily because the inspection certificate was not up-to-date. By the time the doors to Kresge Auditorium opened at 7:30 p.m. last Friday, the line of students awaiting the unveiling of the Class of 2008 brass rat stretched almost to Massachusetts Avenue. This year’s ring is “simple and elegant,” and students generally liked the design, though a few said that it lacked symbols special to the Class of 2008, said Ring Committee Chairman Joshua A. Geltman ’08. In his State of the Union address January 31, President Bush announced two plans: the American Competitive Initiative and the Advanced Energy Initiative. Last Monday, the proposed budget for Fiscal Year 2007 was unveiled, detailing the specifics of the two initiatives. A male was assaulted and stabbed by a group of unknown males on Main Street near the Kendall “T” station around 8:15 p.m. Saturday, Feb. 11, according to an MIT Campus Police Crime Alert Bulletin. The group, which consisted of 15- to 17-year-old Hispanic, white, and black males, harassed the victim before assaulting and punching him. The victim was then “poked” in the back by one of the attackers. The Cambridge Police Department is investigating the incident. 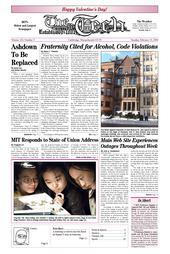 Both the victim and the attackers were not affiliated with MIT, according to the bulletin.